After many years experience with these packs we are ready to sell them to the general public. They have been used for robots, mineral exploration, and military applications. They have high capacity, low weight and can deliver high power. High-power lithium iron phosphate batteries are now a reality. They can be used as storage cells or power sources. In addition, Lithium Iron Phosphate batteries are among the longest lived batteries ever developed. Test data in the laboratory show more than 2000 charge/discharge cycles. The reason that these packs are being promoted is that quality chargers and battery management boards are included. 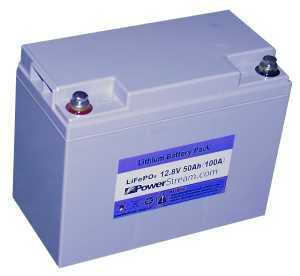 So this is a turn-key solution for anyone needing a nominal 12 volt battery with higher energy capacity than lead acid. A comprable lead-acid battey would weigh 40 pounds, these come in at about 20 pounds. A comparible lead-acid battery would last for 200-300 deep cycles these last for 2000. At this time we stock 2-10 pieces. If not in stock these packs take about 4 weeks to obtain. 10.1 x 8 x 5.1 inchesIncluding tough plastic case. Cycle life 1000 to 2000+ cycles.